One of my favorite easy meals is a tofu scramble. 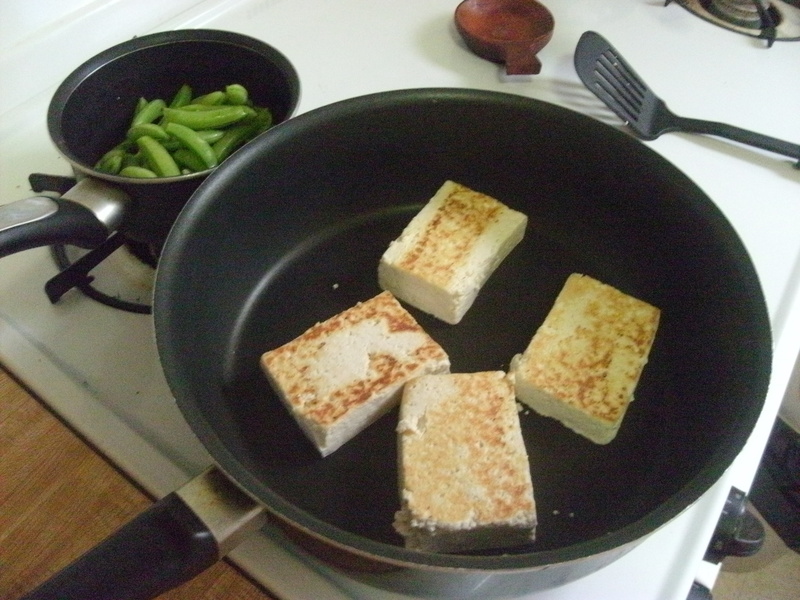 It’s a great way to introduce tofu into your diet without too much trouble, and in fact, I made my first when I was in junior-high and just learning to cook plant-based food. That first recipe came in the Vegetarian Started Kit I had ordered from PETA, and was the first time I made something edible from tofu. The simplest scrambles are usually tofu, onion, potatoes, bell peppers, and whatever else you have lying around, plus a sauce. My first had barbecue sauce on it, and I know I’ve eaten it with ketchup when I was really feeling lazy. Today’s scramble is a little more gourmet. I found some beautiful Swiss chard at the farmers’ market, as well as sugar-snap peas that I somehow resisted the urge to polish off raw on my walk home (cherry tomatoes didn’t fare so well). I’ve found that chard is rather bitter on its own, so from How to Cook Everything Vegetarian I got the idea to add an orange to it to balance that out. Also more reason to use those sweet sweet peas! For this recipe, you need a big deep skillet or a wok. 1. Drain the tofu and squeeze out as much water as you can. When I have the time, I like to cut mine into 4 slabs and brown it in a non-stick pan over medium-high flame before I scramble it. You can skip that step and just crumble it into the pan if you want. 2. If you browned it, break up the tofu slabs with a wooden spoon. Add the chard stems to the pan with a little water and put a lid on it to soften them up for a few minutes. 3. Meanwhile, steam the peas. I did this separately because I know that sugar-snaps are awful if overcooked. They need only 2 or 3 minutes to get bright green. You want them to still be sweet and a little crunchy. Then drain them and set aside. 4. Add the chard leaves to the big pan and put the lid back on after giving it a good stir. If they don’t all fit, have no fear! They’ll cook down enough in a few minutes to add the rest. 5. 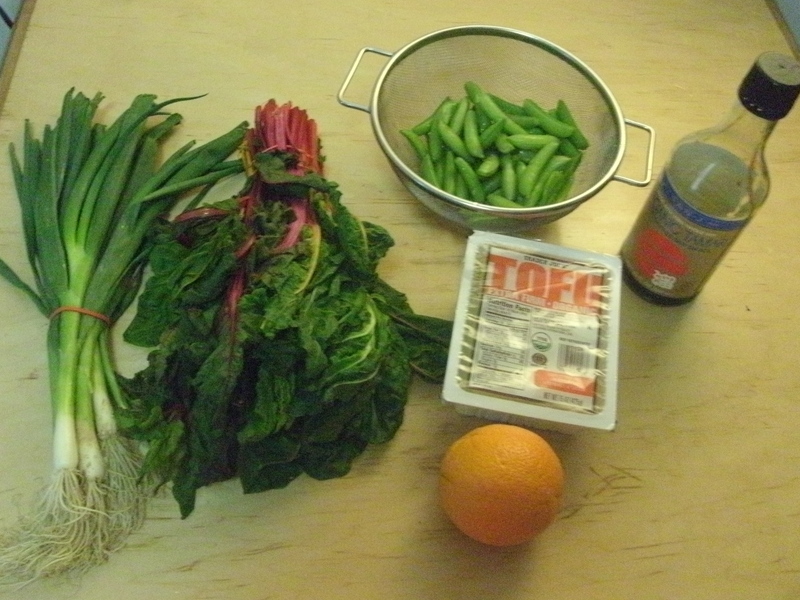 Once all the greens have wilted, add the orange, scallions, tamari, and sesame seeds. Stir and cook uncovered for a few minutes to blend the flavors, then add the peas. Stir it some more, adjust the seasonings, and serve with fresh ground pepper. Enjoy a healthy and hearty meal! Depending on how big your appetite is, you should be able to get 4-6 servings out of this. Don’t worry about eating too much! The bulk of this is greens, so it has lots of nutritional punch and few calories. I definitely have to try this one!! I’ve always been nervous about trying to cook tofu because it seems so easy to do it so wrong. But this seems simple and tasty! I need a protein rich breakfast alternative to eggs, also. Enjoy it! You can also make a simpler version out of ingredients from your freezer: Use regular peas and frozen spinach (or other greens). No chopping required! Try it with all sorts of veggies. But don’t discount this orange juice-soy sauce combo. It’s SO GOOD.